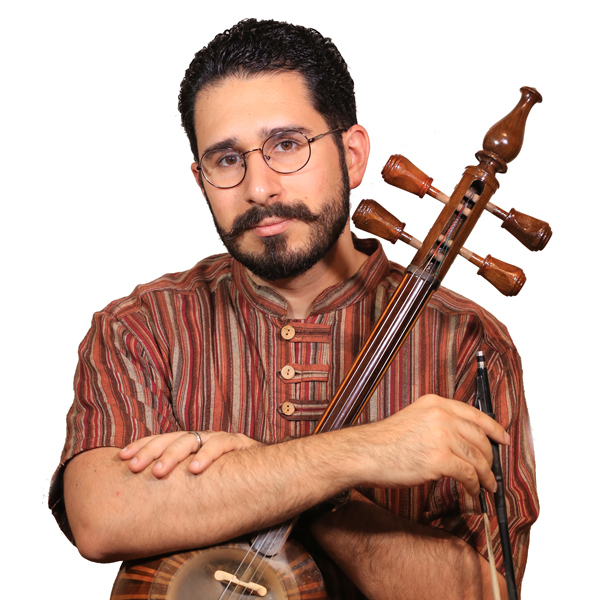 Payam Yousefi is a kamancheh player, composer, educator and music scholar. Ph.D. candidate and Teaching Fellow in the Music Department at Harvard University. He has extensively studied both the vocal and instrumental radif-s of Classical Persian Music. Payam was trained in avaz, and javab-avaz under the tutelage of Masumeh Mehrali, and studied the canonic and contemporary repertoire of the kamancheh under the direction of Negar Kharkan and Ardeshir Kamkar. In Iran Payam was a lecturer in the music department of the Tehran University of Art, teaching graduate courses on ethnomusicology, classical Persian music, musical analysis, transcription methods, and comparative radif studies. As a scholar, he has studied with notable figures in ethnomusicology and musicology. At UCLA he studied closely with Dr. Ali Jihad Racy and Dr. Münir Beken, with whom he conducted research on issues pertaining to music in the Arab World and Turkey consisting of comparative and specialized studies on theoretical issues of mode, magham, rhythm, improvisation, and oral transmission. At Harvard, he has continued these inquiries into Central Asia under the guidance of Dr. Richard Wolf. Other notable music scholars he has studied with include professors Kay Kaufmann Shelemay, Daniel Neuman, Helen Rees, and Timothy Taylor. Ephron prize-winning film Farah Goes Bang, and The Dove Flyer. He continues to perform internationally at notable venues inside and outside Iran while persisting in his scholarly work on Classical Persian music. As a music instructor, he aims to integrate his scholarly perspectives, and musical training in order to systematically expose students to varying styles and modes of knowing Iranian music.